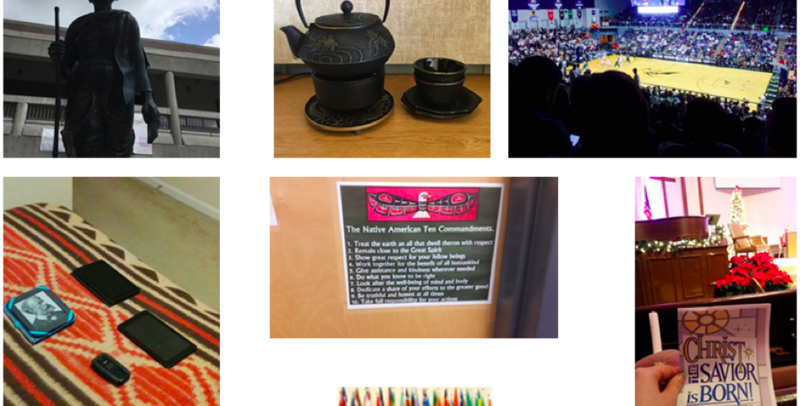 “Observations through Photovoice” is a participatory project that invites undergraduate students to demonstrate knowledge of basic anthropological themes by taking digital photographs of cultural phenomena in their own social worlds. Many undergraduate instructors struggle to engage students in large, survey-style courses. Due to potentially very large enrollments, instructors hesitate to assign lengthy tasks (i.e. essays or research projects), and often rely on assessments with objective or concrete answers that are relatively easy to grade (i.e. multiple-choice exams and quizzes). 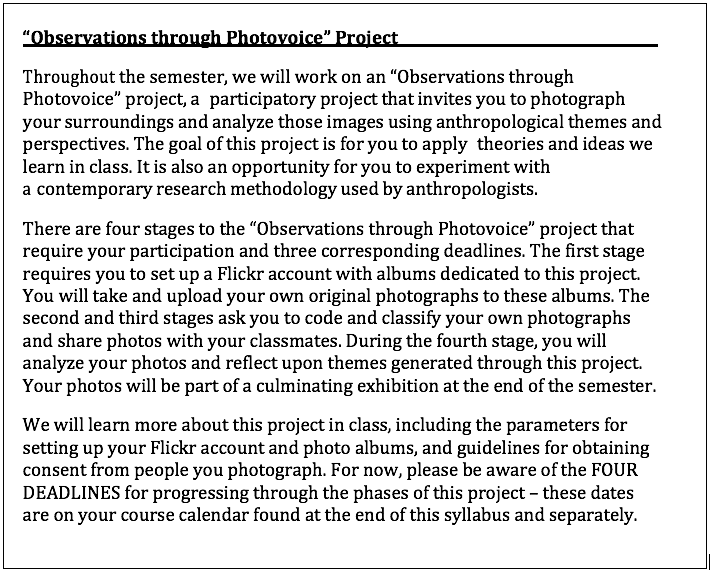 This assignment describes an alternative opportunity for participation and assessment, “Observations through Photovoice.” This project-based learning experiment was developed for an introductory anthropology class at the University of North Florida. Photovoice, developed most notably by public health researchers Wang and Burris (1997), is a data collection technique that “uses photography as a means of accessing other people’s worlds and making those worlds accessible to others” (Booth and Booth 2003 p. 431). Through collecting, curating, and annotating digital images, students actively demonstrate their understanding of basic concepts in anthropology while also gaining the authentic experience of employing contemporary qualitative research methodology. In Fall 2015, we piloted a project to engage undergraduate students in Introduction to Anthropology, a large survey-style course that fills a General Education requirement at the University of North Florida (UNF). Pfister’s year-long ethnographic fieldwork among deaf youth participants and their families in Mexico City, Mexico (Pfister 2015a; Pfister 2015b; Pfister 2013a; Pfister 2013b; Pfister 2013c) was the inspiration for using photovoice as a pedagogical approach. “Observations through Photovoice” is a participatory, semester-long project that invites undergraduate students to demonstrate their understanding of central themes in anthropology by taking photographs capturing cultural phenomena in their social worlds on and off campus (Fig. 1). 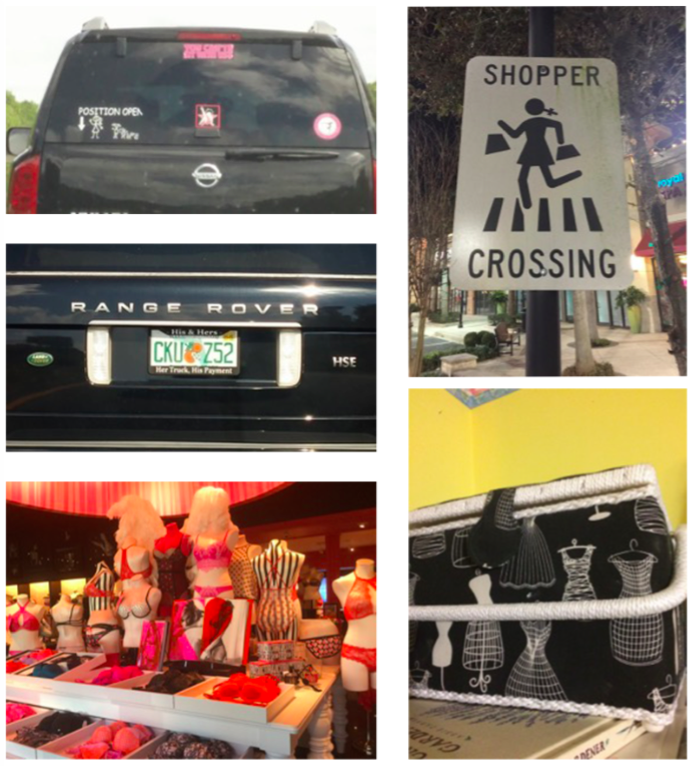 Participants (in this case, undergraduate students) take digital images in response to questions and themes. This approach encourages participation, builds rapport among researchers and participants, and also provides the opportunity for creative expression and the exploration of participant-generated themes. As they engage with anthropological questions and digital imagery, students also experiment with data generation, contextualization, coding, and analysis. Figure 1. Project Description from Syllabus. At the start of the semester, students generate photographs based on a broad, central concept in anthropology: socialization (see Figs. 2-8). As students are gradually introduced to more complex social themes (such as gender, race, and ethnicity), they create additional collections that reflect these themes. By creating digital images and coding them by themes that align with Student Learning Outcomes (See Fig. 25), students actively demonstrate their understanding of basic concepts in anthropology. At the end of the semester, students review their entire collection of photographs to further classify and contextualize their images, and to potentially add to their image collection. They choose two images from each of the three original themes, analyze them, and submit them for a final in-class exhibition and reflection. Figures 2 – 8. Students’ Images Related to Photovoice Theme “Socialization”. Figures 9 – 13. 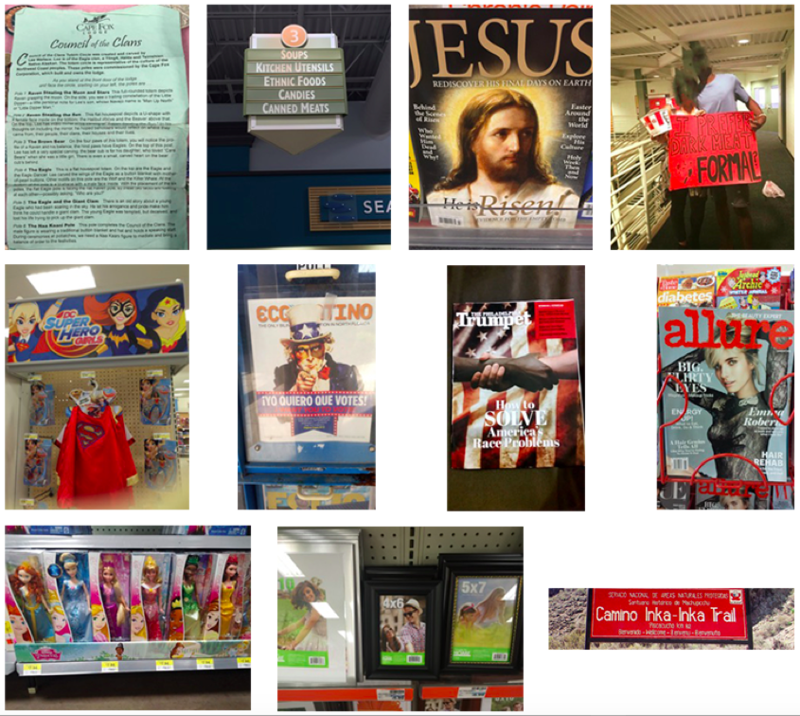 Students’ Images Related to Photovoice Themes “Gender and Sexuality”. Figures 14 – 24. 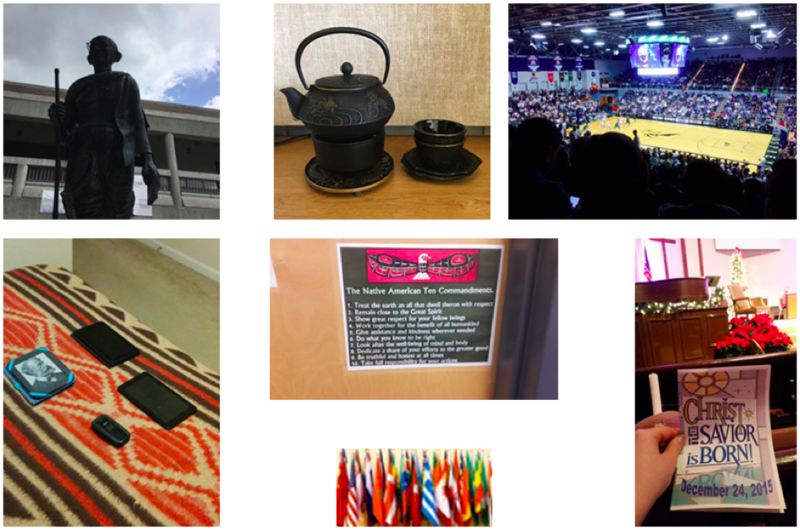 Students’ Images Related to Photovoice Themes “Race, Ethnicity, and Language”. Figure 25. A description of Student Learning Outcomes. Several tools were evaluated as potential platforms for piloting this project (Table 1). Blackboard has adequate tools for collecting and grading assignments, but not for creating sets of photographs or exhibiting them. Google Photos can be used to create sets of photographs, the privacy settings of a set can be restricted, and it allows users to create slideshows. However, it does not allow tagging photos, and the photograph’s description is hidden in the default view. Google Groups and VoiceThread are designed for more collaborative projects. Flickr provides the best set of features for this project including 1) a tagging feature to categorize photographs by social themes, 2) space for descriptions and titles for photographs, and 3) availability of private and public albums that can be used to create sets of photographs. The in-class exhibit was facilitated by creating a Flickr group where students displayed their final image collections. The only requirement Flickr did not meet was the ability to submit and grade the students’ albums. Each stage (as described in fig. 1) was an individual assignment submitted as a link in Blackboard. As a pedagogical strategy, “Observations through Photovoice” confers benefits to students and the instructor. For example, there is less of a burden on the instructor to find contemporary examples of social phenomena that are relevant to students. By asking students to bring their social worlds into the classroom, students engage with the social issues most relevant to them and apply anthropological themes and theories to the context of their lives. The participatory nature of this assignment also offers authentic opportunities for engaging these concepts creatively: students think critically about their own socialization by evaluating their surroundings and find personal relevance in course material by selecting associated topics that most interest them. With a large number of students in survey-style courses, “Observations through Photovoice” offers a chance for students to demonstrate knowledge beyond more traditional assessments like writing, quizzes, and exams, and it is relatively quick to grade. In anonymous, end-of-the-term course evaluations, students described their experience with photovoice as “creative”, “relatable”, and “interactive”. The dynamic nature of “Observations through Photovoice” engages students with different learning preferences (visual, linguistic, kinesthetic, analytical, and global learners) by offering authentic learning opportunities beyond the walls of the lecture hall. Specifically, students reflected on their own social worlds and applied anthropological theories through guided practice with photovoice methodology. In the future, we aim to use this pedagogical tool to help students sharpen their analytical skills. Reflecting upon the quality of the analyses during the pilot semester, we found that many students only superficially analyzed race and gender issues depicted in their photographs. Students did not appear to have trouble documenting images they identified as evidence of cultural constructions of race and/or gender. However, most only analyzed the ‘race’ and ‘gender’ issues that were readily identifiable; they seemed to avoid analyses that were provocative. For example, there were many images of commercial products featuring mostly “white” models or characters (like the examples in figs. 19-21), but fewer images that depicted race relations in students’ lives (like fig. 18) or broader contemporary social issues involving race (like fig. 23). Blogging activities, comment threads, and discussion forums could be incorporated to encourage more critical discussion among students about the images they produced and the more complex issues these images represent. An additional drawback is that Flickr displays students’ names. While this was necessary for instructor assessment, perhaps the lack of anonymity made students hesitant to reflect openly and critically about race and gender issues knowing their peers would also read their thoughts. Instructors using photovoice might consider having students register with pseudonyms and make their identities known to the instructors. As a long-term goal, we plan to develop an “Observations through Photovoice” website to display students’ images in a culminating exposition (a project sponsored by UNF’s Digital Humanities Initiative — see http://unfdhi.org/portfolio/observations-through-photovoice/). A website housing students’ images and analyses could maximize the interactive component of the photovoice project and increase its visibility and impact. Booth, Tim, and Wendy Booth. 2003. In the frame: Photovoice and mothers with learning difficulties. Disability & Society 18 (4): 431. Pfister, Anne E. 2015. Childhood and deafness. Neos – Anthropology of Children and Youth Interest Group Newsletter. ———. 2015. Myths and miracles in mexico city: Treatment seeking, language socialization, and identity among deaf youth and their families.University of South Florida. ———. 2015. Proyecto fotovoz: The everyday lives of young people attending instituto pedagógico para problemas de lenguaje in Mexico City. Medicine Anthropology Theory (MAT) 2 (1): 127–135. ———. 2013. Proyecto Fotovoz/Photovoice project – recycled minds picture Show – Recycled minds: Thoughts from our heads to yours. Available from http://www.recycledminds.com/2013/09/Proyecto.Fotovoz.Pfister.html. ———. 2013. Ethnographic strategies for engaging deaf youth participants: Photovoice & participatory analysis. Student Anthropologist 3 (3): 34-46. Wang, Caroline C., and Mary Ann Burris. 1997. Photovoice: Concept, methodology and use for participatory needs assessment. Health Education & Behavior 24 (3): 369-387. Anne E. Pfister, PhD, is assistant professor of anthropology at the University of North Florida. Her research investigates the experience of deafness among deaf children and their families in Mexico City, Mexico. To address the interrelatedness of human biology, culture, and language among deaf participants, Pfister integrates the analytical lens of medical anthropology with sociocultural-linguistic theoretical approaches. Pfister designed yearlong community-based research utilizing innovative ethnographic methodology, including photovoice and personal history timelines. David Wilson is assistant director of the Center for Instruction and Research Technology at the University of North Florida. He has been working in higher education to support faculty with their teaching, research, and service since 2000. During that time he has worked on a diverse set of projects using a wide set of skills. Dave currently concentrates on media, online survey support, data management, and data visualization.